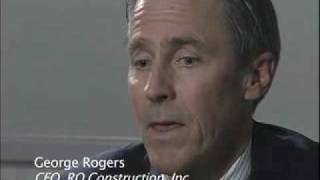 Founded in 1996, RQ Construction, Inc., quickly grew to look and behave like a "traditional" construction company. It successfully completed projects for clients, but RQ lacked a professional management approach, which over time led to problems. Fundamentally, RQ didn't have strategic alignment of its goals, nor a well thought out corporate strategy, according to George Rogers, III, the company's president and CEO. In terms of revenues, there were good years, but micromanagement and management distrust by company seniors bred dishonesty and distrust among personnel. Without a well-defined strategy, people followed their own agendas and expected to be told what to do. Innovation and productivity suffered, leading to poor company morale. Some simply didn't believe change was necessary while others viewed it as impossible. By 2001, Rogers recognized that RQ needed a more professional edge and structured management approach. When he was told that was exactly what MAP could deliver, Rogers tested the waters by attending MAP's signature 2.5-day executive development workshop in Newport Beach. From this powerful workshop, Rogers grasped the MAP system basics but knew he needed to hire one of MAP's top-notch business coaches to drive professional management and culture change in RQ. Once onboard as a business partner, MAP's coach immediately assisted Rogers and the RQ Management Team in forming Vital Factor Teams, which set up strong communication and controls, enabling effective operations built around accountability. This highly structured system specifically supported RQ in establishing goals, which exposed prior company "sins" and identified the steps needed for change. To build teamwork and collaborative decision-making, MAP's team consulting process was used with the RQ staff to solve problems quickly through ownership and accountability. In addition, steps were eventually taken to change the culture, i.e., the elimination of personnel who didn't align with the company values or the new culture of performance and accountability. RQ then brought on new personnel who fit in with the desired company culture. Through RQ's dedicated leadership, supported by MAP's system and its personalized, detail-oriented coaching, RQ has seen a 20-25 percent increase in profits, plus a 30 percent hike in revenues since 2001. Cash flow has improved significantly, enabling investments in new directions that now give RQ a competitive edge. However, such results and rewards didn't manifest immediately due to a steep learning curve related to the understanding of management, accountability and real change, Rogers notes. Implementing the MAP system - and the "real" change - in the proper way has required time, patience and persistence. RQ has also experienced major efficiencies through operational improvements. MAP's coach has helped Rogers and his team grasp fundamental principles like understanding what is a "good" cost or investment versus what is a waste or detracts from real value. RQ learned another valuable lesson: To change the culture, you must be willing to change out people. Neither is easy or painless. Also tough is changing old habits of great team members' who've been with the company since the beginning. But with a healthier, more transparent workplace culture now in place, employee performance and productivity is up in every way - and making a big difference. Today, RQ is one of Southern California's top commercial and governmental construction firms with revenues of $130+ million and an aggregate contract value of roughly $1 billion.